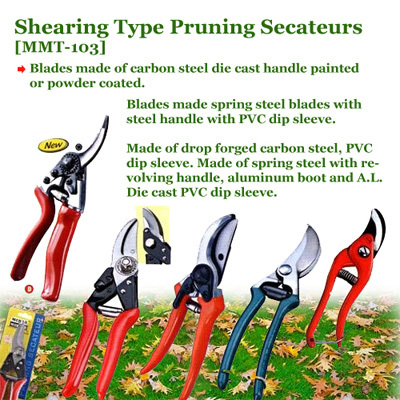 We are one of the leading manufacturers and exporters of Pruning Shears. There are special blades that are made out of carbon steel die cast handle painted or powder coated. There are also spring steel blades with steel handle with PVC dip sleeve, which are highly professional. These are blades are manufactured out of drop forged carbon steel, PVC dip sleeve so that these facilitate easy working. In addition to this there are also blades made of spring steel with revolving handle, aluminum boot and A.L.Die cast PVC dip sleeve.